So you want to paint, but you’re better at drawing. 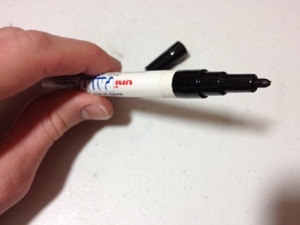 Or you want to mark on some surface unsuitable for Sharpie or other permanent markers. 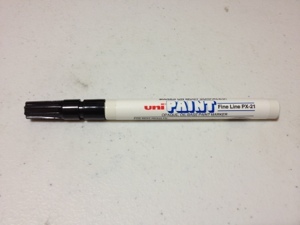 Well, the Uni Paint PX-21 by Sanford may be for you. This pen is oil-based and needs to be shaken up like a spray can before use. It has a “fine” point, which means a medium or even broad point if you compare it to anything that is a not a paint pen. The line it writes is solid and about as thick as a large Crayola marker. This particular version is the black version which is especially solid, though it is fairly shiny, somewhere between a Sharpie and a matte black spray in terms of marking on plastic. It does mark on literally anything, though some shiner plastics and polished metals have it wear off easily. The body of the pen is metal and feels solid in the hand. A shiny label has all the necessary information printed on it, including warnings and such. This label makes the pen slightly slippery in the hand so tight gripping is necessary. The cap matches the color of the paint. It has ridges that are sharp and cut into the skin. It also fits very snugly onto the end, meaning it is quite difficult to remove, which is both a hindrance and a benefit. Also be warned that since it is an oil-based pen it stinks mightily and will give you a headache after a few minutes of constant exposure. The label even tells you to put the cap on immediately after use, though this is most likely also to not let the paint dry out. Overall this is a great little painting device. It is especially handy for touchups on plastic and metal painting. Or, if you’re like my relatives and have a shop were regular markers and price tags have a hard time sticking to the stock. It’s not really a home item, or one that will be useful to canvas painters, but it certainly will have its place with sculptors and model builders.